In 1871, the General Assembly of Virginia passed a public school bill. 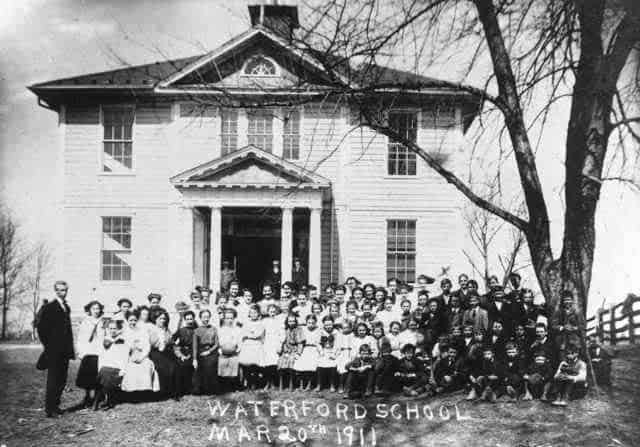 Six years later action was taken to bring public education to Waterford. In August 1872, patrons and friends met at the former private Waterford Academy, where county superintendent Wildman explained the working of the new public school system. The school trustees appointed a committee of two Quaker men and William Mount, one of our furniture makers, to raise money to pay the teachers. By the end of the meeting, they had gathered $236, about half the money needed, and expected they would obtain the rest "with little effort." As a reporter put it, "It is evident that the people of this ancient town are alive to the best interest of their children, and are determined to have for them good Schools." In 1877, Edwin A. Atlee sold one and one-half acres of land bounded by High Street and Butchers Row to the school trustees of Jefferson District, for the sum of $350, the site to be used for the construction of a public school. The cost of this building and the identity of the first teachers do not appear in the records. The records do reveal, however, that for the session 1886-87, the faculty was comprised of Alma Karstetter, Ella Steer and Jeanette Lewis with a high enrollment of 82 and a low of 66. For the term 1904-05 we are given some insight to current salaries: Virginia Taylor, principal, $42 per month; Minnie E. Russell and Mary Shawen, teachers, were each paid $27. The first building was destroyed by fire in February, 1909. The janitor in cleaning the coal stoves left a bucket of hot ashes sit- ting on the wooden floor, thus starting a fire that soon consumed the building. Classes were held in the basement of the Baptist Church until the new building was completed. This building, erected on the site of the old one, was ready for occupancy for the 1910-11 term with R. H. Snodgrass as Principal. This imposing new structure was built at a cost of $6,000 with funds from the following resources: private donors $1,500; insurance from old building $1,350; and from the Literary Fund $2, (don't check the mathematics of this breakdown too closely). For nearly 20 years after this building was erected, graduations and other school events were held at Paxson's Hall, above a rickety livery stable next to the Pink House in the middle of town. It was hot in the warm months, cold in the winter, and featured ancient folding chairs advertising Piedmont Cigarettes--chairs prone to collapse without warning. Finally, at a meeting on July 29, 1927, a committee of five men, Doug Myers (uncle of current Waterford resident Janet Jewell), R.C. Compher, W.E. 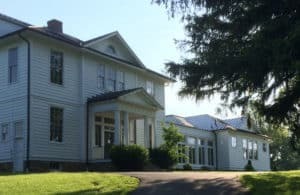 Steele (at Talbott Farm), Fred Stabler of the Phillips Farm, and his neighbor R. E. McCarty, made an agreement with the Loudoun County School Board. The Board would provide $6,000 for a new auditorium, coincidentally the same amount as the school had cost 20 years earlier. But the school board refused to fund such luxuries as electricity, heating, furniture, and a stage curtain. So Marilyn Gentry's grandmother Josephine Carr and John Divine's mother Nanny, wife of Eb Divine who was building the auditorium, held bake sales, put on plays and did anything they could think of to raise money for their new auditorium, just as we are doing today. It took several years to collect the needed amount. For the first few high school graduations in the new facility, they salvaged the old Piedmont Cigarette chairs "from downtown." At the baccalaureate of the class of 1929 (all of two students) the wide open windows let in breezes on a hot day, and the featured speaker read from a large stack of papers. One gust caught the pile and scattered it to the floor. Suddenly struck dumb, the speaker threw up his hands and said, "Oh, well." Most in the audience didn't think it was very interesting anyway. Divine, John E. Dedication-open house- Waterford Elementary school. December 6, 1965. Document of agreement between Loudoun County School Board and representatives of the Community League, July 29, 1927. From the Waterford Foundation Booklet of 1981 and an article by Bronwen Souders in 2011.